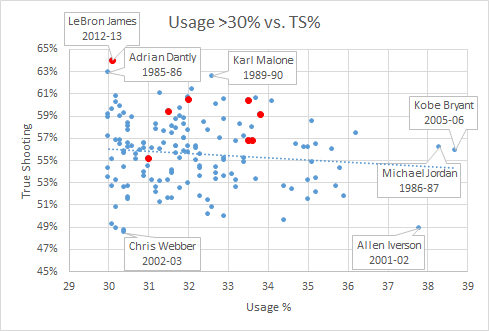 Just eyeballing it, isn’t Malone’s residual bigger than Dantley’s? 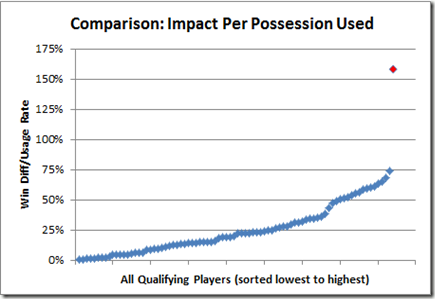 Further, it looks like the residuals get smaller as the usage goes up so there’s probably some log function you’d use for matching across usage that would make Malone’s achievement even greater. I don’t know about Dantley, man. In the margin of victory analysis from the Rodman piece (https://skepticalsports.com/WOWYMaster.htm, offline but can still be found via wayback machine), Dantley was the worst of all qualifying players, worth -3.143 points per game. Catastrophic.